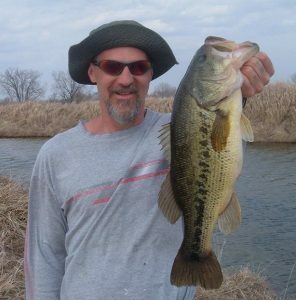 Today’s post is proof that April can be a darn good time to fool some quality bass as they welcome increasing warmth and daylight while gearing up to make more bass. As proof I’m going to double up this Friday with a pair of four-pound duo days in Knox County, IL. The first fish story comes from Lake Bracken back in the time period when it was literally my backyard. And I caught this pair of bass within view of my house on Island Lane. Now that’s pretty cool, kind of miss those days when I could walk down the hill to the dock, toss in the two-man boat and start casting. 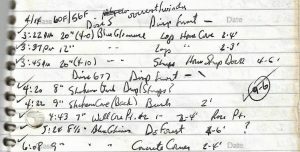 On this day, that casting was rewarded with some rather instant feedback as I had two four-pounders in the log in under a half hour of launching the boat. Four pounders don’t happen every day for me, let alone two in one day. Well, except for the second half of today’s flashback. Today’s other fish story took place on some walk-in strip pits during the second year I had fished the area. Just so happened that the first of my pair of four-pounders on April 12, 2014 came from a spot that I named 2×4 Lake the previous year. Yep, in September 2013 it had given up two four-pounders in a span of ten minutes (another tale for another day). Several hours after the four-pounder on 2×4 I nabbed another on a spot I call Twin Lake. April 2019 hasn’t been quite as friendly in terms of quality bass although I have managed to find some decent numbers. Still over two weeks of the month remaining although this weekend does not look particularly favorable. 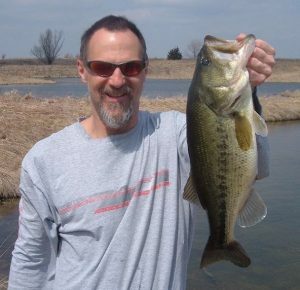 Perhaps Easter weekend will hold another fish story to add to those that were featured in last week’s Friday Flashback.